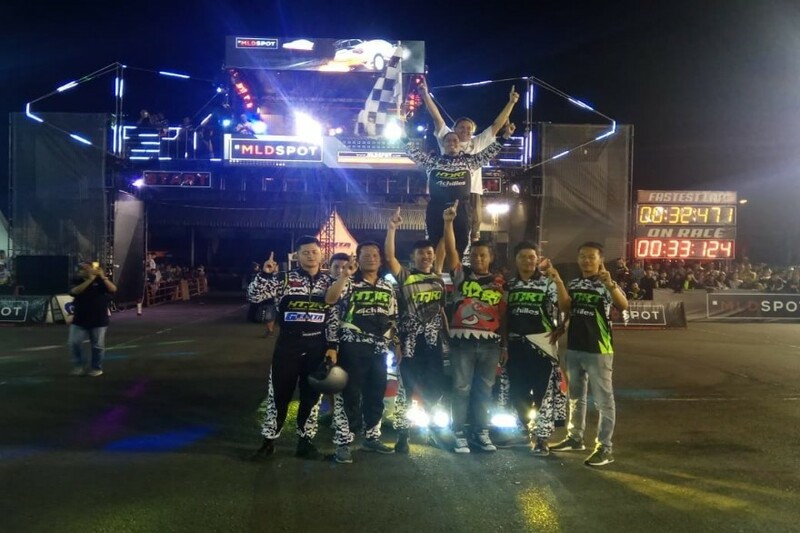 Being held at the Pasar Hayam Terminal, Cianjur, West Java on Saturday (15/9) evening, Reindy Riuppasa of the HTJRT Team came out as the winner of the 2018 Auto Gymkhana Series 4 Class A. Driving his Honda Jazz, Reindy successfully set the fastest record with 32.471 seconds and became the winner by beating his foes with a 00.442 seconds time difference. He was balancing the accuracy and maximize the speed in order to come out as the winner. Reindy also shared a little of his experience on Slalom on the previous race, “I’m won the general championship A and won 3rd place on the standard 1500cc A1 class on the previous HTJRT. In this race, I come out as the runner up of B2 class and B open,” he said. He also gave his opinion on the 195/50-15 Achilles ATR Sport and 123S, the tires that help him won the race. “I was using Achilles 123S for the front tires and ATR Sport for the rear tires. I think the 123S is good for slalom, it has good grip and the grip is stable in both afternoon track and in the evening,” he said. In the class B, Reindy used Daihatsu Himax and added to his opinion on the Achilles 123S, “I also participated in class B, in the rear wheels movement using Daihatsu Himax, and I also used Achilles 123S, and its grip is exception,” he said. Dimas Adrie Yahya from Brand Management Achilles gave his opinion on Achilles 123S and ATR Sport which were especially designed for competition, “ Achilles 123S has Circular Tread and is designed for racing, the tread is unique so it will be easy and fast in transition from the straight-line sprints to high-speed cornering so it create an easy and superior handling. While ATR Sport is design with a solid center rib so it has a stable straight-line to help in handling the vehicle in fast speed,” he said.